Thank you for choosing Collar Me Charming! All of our collars and accessories are made with love for you and your dog to enjoy. Due to the handmade nature of our products, no two Collar Me Charming collars are alike and patterns shown above may appear different on your collar. As with the seasons, we are changing our fabrics constantly, so make sure to buy up on your favorite products now! And as always…FREE SHIPPING in the US! Yappy shopping! This listing is for the dog collar only. Flowers/bow-ties are available for purchase as part of a set. -100% quality designer cotton and suiting fabrics. -Each collar is constructed using quality hardware, strong nylon webbing with interfacing, and each is triple stitched to ensure you can still play hard with your pup. -We only use curved side release buckles, designed to hug your dog's neck, so they can be comfortable and stylish too! Measure your pets neck using soft tape or string. Add 2 inches to the size of your dogs neck. If you have a specific size or questions please let us know in the "message to seller" box. Want a specific size made especially for your dog? Is your pooch going to be in a wedding or special event and needs a custom collar to match the rest of the party? Convo me for a custom order and we will be sure to make them the perfect match. Your gifts will be in a wrapped box, inside the box will be a the products you ordered, custom gift tag (to:from:) , tissue paper, and special treats! Perfect fall bow tie! High quality and very durable. Perfect for my little guy! Collar Me Charming accepts PayPal, all major credit cards, and Etsy gift cards. Customer service and your satisfaction is of the upmost importance to us. I want to make sure you are entirely happy with your purchase. If you have any concerns please contact me so we can resolve any issues. Just like our dogs, we always want to see a smiling face! Please note: I personally make all of Collar Me Charming’s products by hand. To avoid any sizing issues please measure your pups neck before determining a size. If you are unsure of the size you need or have any questions please contact me. Prior to returning an item for refund or exchange please contact me. Items must be returned in "as new" condition. Buyer is responsible for all shipping costs involved with the return and all returned merchandise must be sent with a delivery confirmation or tracking number. - All domestic packages ship to you for FREE using USPS First Class mail with delivery confirmation. A tracking number will be provided after purchase confirmation. - If you would like to select 2-day priority shipping, please make sure to select that shipping method upon check out. Please note this only expedites the shipping not the manufacturing. - International orders ship via USPS First Class mail. Shipping can take anywhere from 2-6 weeks. If you prefer a faster shipping method please contact me before you make your purchase so we can go over your options. - USPS First Class Mail DOES NOT include tracking or insurance. If you would like to be able to track and insure your package, your shipping will have to be upgraded to Priority Mail. Please contact me if you would like to upgrade your shipping. -International customers are responsible for any and all additional duties, taxes or fees imposed by customs in your country. PLEASE NOTE: Though our collars are tough, be a responsible mom or dad and check for the wear and tear of the product over time. 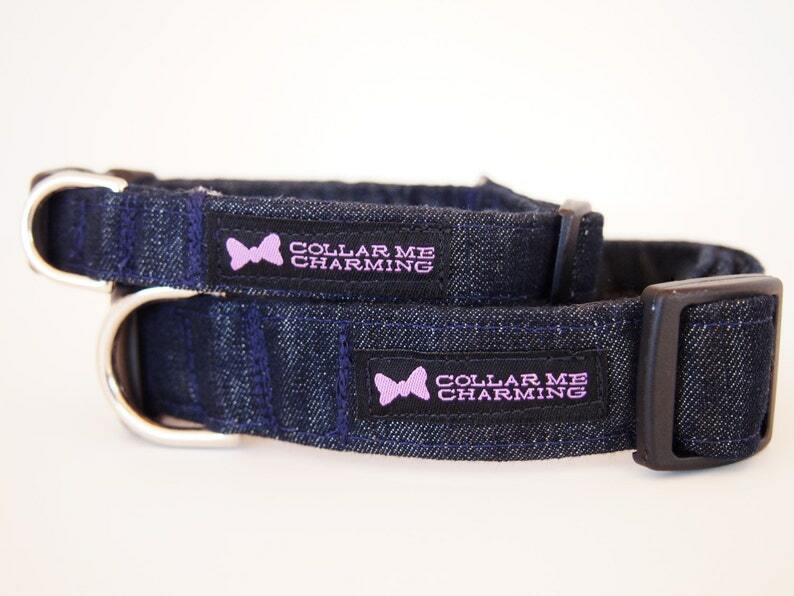 Collar Me Charming products are not intended to be worn by your pet while they are tied in/out unsupervised. The customer is responsible for the suitability of Collar Me Charming products and assumes all responsibility and liability by purchasing these products.